These tips come from Heidi Schauster’s book called Nourished which focuses on healing your relationship with food, body and self. I had a chance to review this book and loved Heidi’s approach. I can tell you I was not always a healthy eater and it showed. When enough was enough I knew I had to change. In the beginning of my journey I was very guilty of the “shoulds” and “shouldn’ts” in step two at times. I knew I should eat the fresh fruit for dessert and shouldn’t eat my favorite sea salted chocolate chip cookies. It doesn’t feel good to beat yourself up every time you eat something you shouldn’t. If you find yourself always tell your self you shouldn’t, incorporating the spot clean eating approach and giving yourself choices to choose better foods, can help you transition you into a very clean eater. At least that was in my case. Overtime, once I started replacing sugary snacks with fresh fruit or replacing half of a mac and cheese serving with some veggies to go along with my steak. Eventually that became a habit. Pretty soon the fruit tasted sweeter, the veggies kept me full longer and I lost the craving for the junk. As I watched the scale go down, my energy level increased. Adding in some exercise helped change my body shape. Seeing the positive changes in the way I felt inside and out kept me motivated to continue. My rule of thumb is an 80/20 approach. 80% of my diet choices are clean foods and 20% are more indulgent. If you know you have an occasion coming up where there will be plenty of indulgent foods you will want to partake in, be sure your meals prior to that are clean. Then when the time comes eat those forbidden foods, enjoy the indulgence and get back on track the next day. Life is full of times where food is involved and you should enjoy those moments! Depriving yourself all the time just sets you up to fail. Using the spot clean eating method allows you to still have some of the foods you crave, which keeps it easier to stay on a path to success. It’s a tough battle as we are the only ones that can control what goes into our mouths. As with any battle, you need some good training and tips to help you win the war. If you are looking to make better choices in what you eat or wonder why you may stress or overeat, Nourished can help you get to the bottom of those triggers and give you a healthier and happier way to look at food. by Heidi Schauster, MS, RDN, CEDRD-S.
Everyone is talking about “Clean Eating.” I’m all for a let’s-get-back-to-recognizing-our-food way of life. I appreciate shorter ingredients lists—ones where I can find whole foods listed and not chemicals. I like shopping at farmers’ markets, eating seasonally and locally. I believe that our bodies and the planet benefit when we eat more whole food and more plants. But as a nutrition therapist and eating-disorders specialist, I worry about us taking clean eating too far. Now, you might say, isn’t it clear that some foods are really more healthful than others? Remember, I’m not talking about unconscious eating here. I truly believe that when we make conscious choices, thinking about our own innate preferences (this sometimes takes trial and error), we end up eating in a balanced, healthy way most of the time. “Shoulds” get in the way of actually tuning in to what feels best in our bodies. Sometimes the foods we say we “shouldn’t” eat become more attractive just because they are forbidden. If I set up a “should eat” situation (that the rebellious part of me might want to undo), then I am using my mind and not my body to decide what to eat. The eating experience is bound to be less satisfying when I apply “shoulds” than if I am making choices from my own body wisdom, learning, and self-care. There is a flurry of conflicting nutritional advice on the internet. How can someone who doesn’t know my body and lifestyle tell me how to eat? Personally, I learned over many years the kinds of meals and snacks that “work” for me. And, in the process, I have maintained enough flexibility so that I can enjoy so many different kinds of foods in different settings. Every once in a while, I discover something that doesn’t feel great in my body. If I trust the latest advice from a nutritional guru on the internet, I might bypass the wisdom that my own body affords me every time I pay attention when I eat. My client Elizabeth has been working hard on finding gray areas in her life. She shared an instance where she found the gray regarding housecleaning. She read in a housekeeping magazine that she was supposed to wash her bathroom floors weekly. She has had that task on her to-do list for a long time but realized that it was often not getting done. And she was really beating herself up about it, particularly when time would go by and she really didn’t like the way the floors looked. Black-and-white thinking kept her stuck. She either cleaned the bathroom entirely, moving all the furnishings and making the floors gleam—or she let it go and had to live with floors that were messier than she liked. It never occurred to her—until recently—that she could spot-clean the floors in between. Instead of thorough weekly cleaning, she could clean the floors well monthly and then spot-clean in between, picking up the things that collect on the bathroom floor without the whole procedure. It parallels some of Elizabeth’s struggles with eating. She goes back and forth between eating “perfectly” and “cleanly”—following all of the rules of the blogs that she follows—or she rebels and starts eating, in her words, “… like crap.” She knows that neither feels good, although the “cleaner” eating has the illusion of feeling great at first; it’s just never been sustainable. The spot-cleaning of her house gave her more freedom and rest to pursue other passions, and spot-clean eating shifted her challenging relationship with food. Instead of eating a large plate of just vegetables or a whole box of plain buttered pasta (one virtuous, in her mind, and one not), she started combining the vegetables and noodles and made a middle-of-the-extremes dish that was satisfying and felt good. So, the next time you are out and you don’t know if the yummy meal you are being served is as “clean” as the one you eat at home … Please don’t panic, don’t starve, don’t ruminate over the ingredients! Make an informed choice whether to eat it or not, based on your knowledge of what feels good in your body. When you find yourself frustrated with eating “good” and “bad” interchangeably, try to give up the struggle. I propose Spot-Clean (versus Clean) Eating, which allows flexibility, pleasure, ease, and space for the rest of the joys of living. 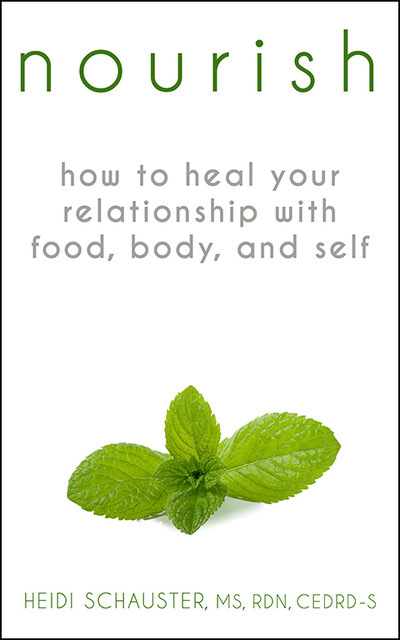 If you enjoyed this edited excerpt from Nourish: How to Heal Your Relationship with Food, Body, and Self, by Heidi Schauster, you can obtain the entire book at https://www.anourishingword.com/the-book/. Heidi Schauster, MS, RDN, CEDRD-S is a nutrition therapist, writer, and the founder of Nourishing Words Nutrition Therapy in the Greater Boston area. Heidi facilitates the No Diet Book Clubs, supervises other nutrition therapists who treat disordered eating, and encourages embodied eating and living for all.